Amerks' Fun Fest a Success · Let's Go Amerks! Today, the Amerks held their first Fun Fest at Blue Cross Arena. My husband and I brought our son down to see what was going on. It was a great time for all of us. At 1:00 when the doors opened there were plenty of kids getting their skates on who were very excited to skate with the players. They had to wait a little while longer because the team was going to be announced at center ice. The whole team came out one by one to fans cheering for them. Stefan Meyer and Drew Larman got the loudest cheers from kids and adults alike. Then Lewis Staats came out to tell the fans how much he appreciates them and how proud he is to be the owner of the Rochester Americans. After that Benoit Groulx came out to introduce himself and say how he is more than happy to be coaching the Amerks this year. Last but not least Rory Fitzpatrick came to the mic to speak on behalf of the players. Then the doors were opened and all the kids and adults (big kids) were let onto the ice. All the players had their own signing pads to give people proper autographs. They all have a nice picture and the logo and also the logo of the Panthers if the player is property of Florida. It’s great to see the team having a really nice way to get people autographs who aren’t card collectors who would like something more than just a piece of paper. I will scan a few of them later tonight so everyone can see what they look like. The Amerks had a team picture taken after their first practice on Tuesday. 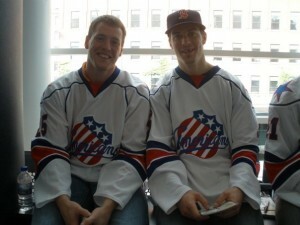 Those were available at the Amerks tent/booth that was set up in the attrium. They were very nice pictures for a pre-season photo shoot. We signed our son up for the Mooseketeers Kids Club which seems like just another great addition to the Amerks this season. For those of you who have children you get a lot for your money when you sign them up for this club. Just in the welcome package alone you get a Mooseketeer Certificate, I.D. with Lanyard, T-shirt, Antlers, Song Lyrics, 32 oz Cup, Schedule with special events, Amerks’ schedule roster, a team photo and a letter from the Amerks’ team. That doesn’t even include the discounts you get throughout the year. All of this is only $20. 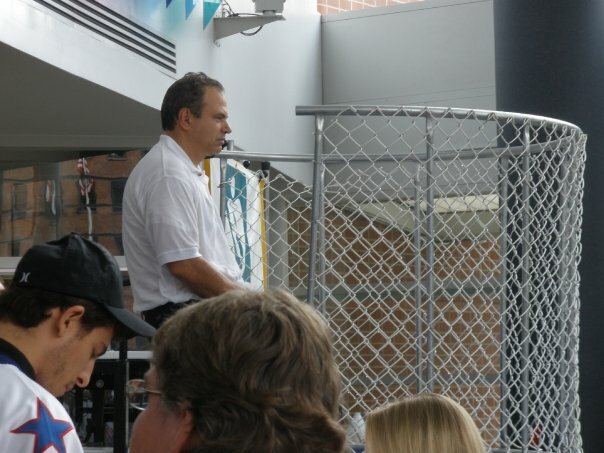 In the main entrance had a big blow up maze for the kids and a dunking booth where members of the Amerks’ staff were being dunked. That was a good time. There were also clowns making balloon animals and face painters. 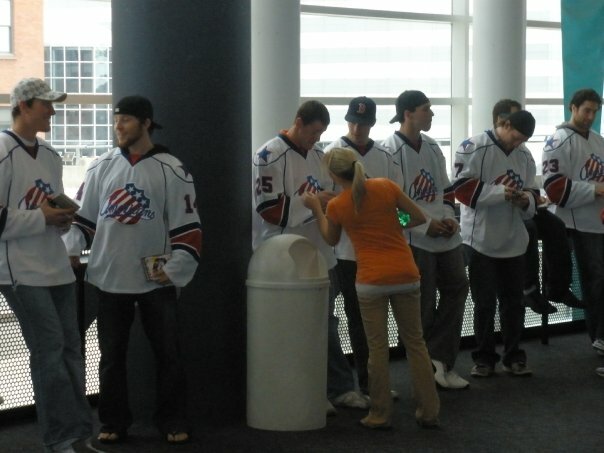 After that we headed up to the atrium to once again meet the players all walking around talking to the fans. Unlike last season, the boys were all very open to talking to everyone. They didn’t huddle around in groups talking to each other closed off to what was going on around them. They all seemed to be having a good time too which is always nice to see at an event like the Fun Fest…seeing as it was supposed to be fun. 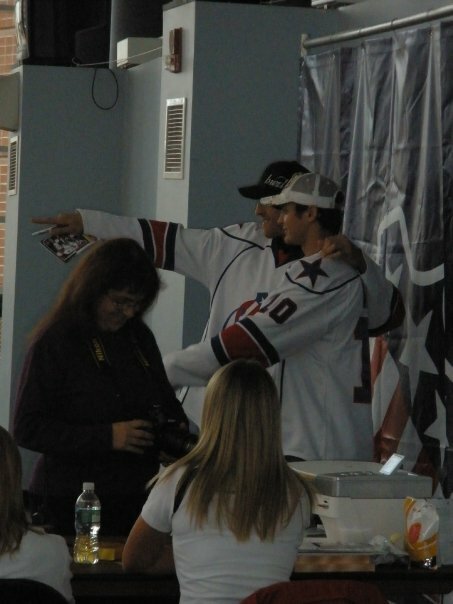 There was a professional photographer taking pictures of fans with players and the new dance team in front of an Amerks’ backdrop. The pictures were instantly printed out. They were good quality and nice to have signed by whoever was in the picture with you immediately. There were a lot of great things about today’s Fun Fest and I personally hope this turns into a yearly tradition. All the fans seemed to be having a good time and I hope the players did too. They should know they made a lot of kids very happy today.